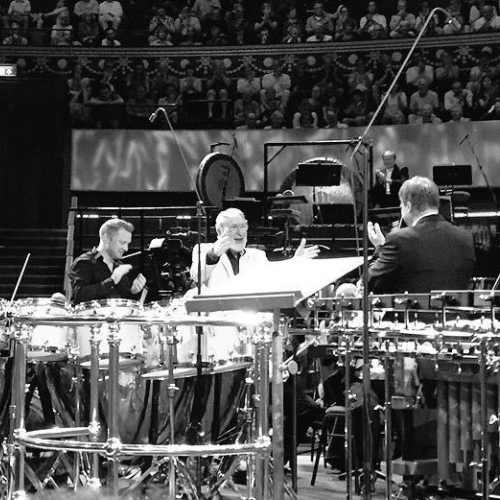 Time waits for no Solo Percussionist and this season has already seen one premiere in the form of HK Gruber's emotionally vast "into the open..." at the BBC Proms in London, with the wonderful BBC Philharmonic and John Storgards. A heartfelt and intense work, the piece remembers, with full grieving rites, David Drew, who was central in Gruber's life and development as a composer. From my earliest meetings with HK, he always chimed with lovely anecdotes about David,"tea with milk", and the early days gaining ground as a published composer, thanks to Drew's support. The music of the concerto serves as a moving epitaph - energetic, enigmatic and eventually desperate as the final sections gradually and dissonantly break apart the entire orchestral edifice. The increasing depth of the silences offering little more than hollow, raw grief. Powerful music, powerfully felt by the Prom audience, and as always, it was a ravishing honour to perform there. "into the open..." sees its second performance at my debut at Wien Modern in November, with the Vienna Symphony Orchestra conducted by Erik Nielson. Andrew Norman's "Switch" for solo percussion and orchestra is co-commissioned by the Utah Symphony Orchestra for their 75th Anniversary Season and the BBC, who's Symphony Orchestra will give the UK Premiere with myself and their Music Director Sakari Oramo in December. For Utah, this is one of three premieres for their special season, with Maestro Thierry Fischer ensuring that their festivities will keep the new admirably close at hand. Other premieres for them this year include those by Augusta Reed Thomas and Nico Muhly - and all of these pieces will be recorded live for joint release. Andrew's music itself scampers and scrapes its way through an imaginary video game scenario, with percussion protagonist reacting to different sections of the orchestra and performing acts of dexterity to "complete levels" in order to gain access to the next game. Onwards and upwards is the goal, but the tasks at hand are challenging - and the conclusion quite the cliff hanger! A zesty new work for my repertoire which can also be heard at Carnegie Hall later in the season, again with the Utah Symphony and Thierry Fischer. My residency with the Oregon Symphony sees its launch this month, with a very varied week in the wider community of Portland and surroundings, as well as my first time performing James MacMillan's "Veni, Veni, Emmanuel" with the orchestra. I'm delighted to be working with Carlos Kalmar again, a passionate and adventurous colleague, whom I love dearly. Other US appearances this season include my debut with the Canton and Hawaii Symphonys, the Naples Philharmonic with Andrey Boreyko, and performances of Julia Wolfe's "riSE and fLY" in Cincinnati. This season also celebrates James MacMillan's glorious, ebullient "Percussion Concerto No.2" as it receives its full package of co-commissioners at the Cabrillo Music Festival, Edinburgh Festival, Baltimore Symphony and Sao Paulo Symphony. It will be an especial honour to perform again with Marin Alsop in Sao Paulo and open their season with this fantastic new work. The lonely-hunting heart of Louis Andreessen's "Tapdance" is part of a weekend dedicated to the composer's music in London this February, and Rautavaara's "Incantations" will have a Spanish Premiere in the same month. Dave Maric's typically, and utterly distinctive "Towards Future's Embrace" has a homecoming in Lapland (the work was premiered there in 2012!) and I will perform Phillip Glass's "Fantasy for Two Timpanists" for the first time, with my buddy from CCG, Owen Gunnel. On that subject, the group (Colin Currie Group) remains busy too with concerts in Helsinki, Rotterdam and at our London home of the Southbank Centre, where we will play "Music for 18 Musicians" in the Festival Hal once again. "Quartet", written, by Reich for myself and the group, can regularly be heard at our concerts. Thanks for such support, and for listening! Keep exploring new music, and if in doubt, listen again via the many online broadcasts and recordings. "Currie dashed from drum set to vibraphone to steel drums, creating a glorious racket"